Back cover blurb: Laurie Frankel's THIS IS HOW IT ALWAYS IS is a warm, touching and bittersweet novel about a family that's just like any other - until it's not. Telling our stories and secrets is hard and scary. And sometimes dangerous. But we must do it anyway because that’s how life gets better for everyone. Rosie and Penn always wanted a daughter. Four sons later, they decide to try one last time - and their beautiful little boy Claude is born. Life continues happily for this big, loving family until the day when Claude says that, when he grows up, he wants to be a girl. As far as Rosie and Penn are concerned, bright, funny and wonderful Claude can be whoever he or she wants. But as problems begin at school and in the community, the family faces a seemingly impossible dilemma: should Claude change, or should they and Claude try to change the world? Warm, touching and bittersweet, THIS IS HOW IT ALWAYS IS is a novel about families, love and how we choose to define ourselves. It will make you laugh and cry - and see the world differently. This is how it always is is a novel that is probably going to divide opinion. Personally, I loved it, it is a stunning novel and one that should be read by everyone no matter what their opinion on transgender. Claude is Rosie and Penn's fifth child, they were hoping for a daughter after four boys, but what they got in Claude was something much more. And all remains fine, until the day comes for Claude to go to school. After a lot of deliberation the family decide to let him go as he wishes, he grows his hair, wears dresses and skirts to school, and becomes to all intents and purposes, a little girl. Poppy. It isn't until Rosie has a scare with a transgender patient in the ER department where she works as a doctor, that she realises how dangerous the world can be for those who are neither wholly (or truly) a boy, or a girl. The family make the difficult decision to move to a more accepting community, but inspite of this, they choose from the outset to portray Claude as Poppy. What none of them can imagine is how difficult it is to keep a secret so huge that it's lifechanging. But what should they truly do for the best? The decisions that they make now will stay with them all for the rest of their lives, so they must be sure that they make the right ones. No matter how hard that may be for all of them. This is how it always is, is an exceptional novel and I look forward to reading more from this author. 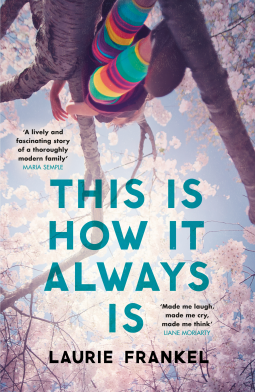 This is how it always is is available now via Amazon online and all good book shops.